This rug was so lovely in the nursery. I previously had a Restoration Hardware Baby rug but returned it due to receiving the wrong color. I did not want to wait 8 weeks for the other color, and decided on this rug instead. It was also less expensive. 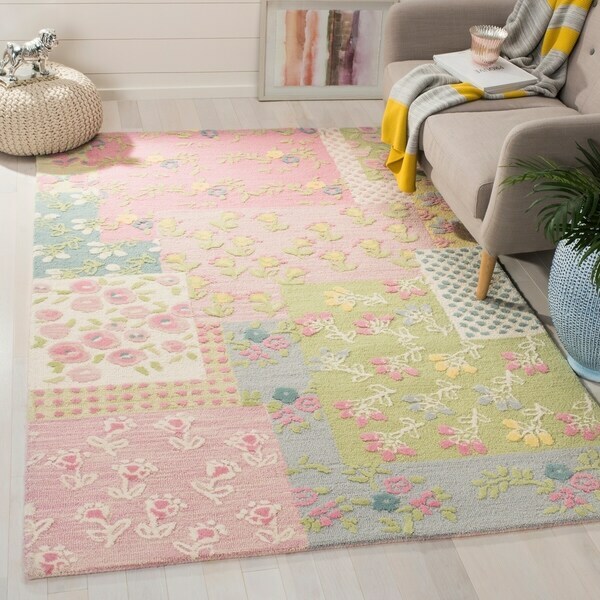 This rug is elegant, pastel colors, and has a delicate look -- it brought so much beauty to the nursery and was just the look I wanted. It does shed somewhat, but all wool rugs do. Take some time in the beginning to vacuum the rug as much as possible, and it will improve. It was shipped on time. This user was entered into a sweepstakes after submitting their honest review. A whimsical children's design and dense, thick pile highlight this ultra soft and plush New Zealand wool pile handmade rug. This floor rug has a multi-colored background and displays stunning panel colors of pink, blue, green and ivory. This rug was so lovely in the nursery. I previously had a Restoration Hardware Baby rug but returned it due to receiving the wrong color. I did not want to wait 8 weeks for the other color, and decided on this rug instead. It was also less expensive. This rug is elegant, pastel colors, and has a delicate look -- it brought so much beauty to the nursery and was just the look I wanted. It does shed somewhat, but all wool rugs do. Take some time in the beginning to vacuum the rug as much as possible, and it will improve. It was shipped on time. love love love this rug!!! i bought this rug for my little girl's playroom and couldn't be happier. it definitely had a bit of a funky smell to it when i first opened it (like some wool sweaters) but that has pretty much dissipated. the quality is excellent and in person it matches the picture (thank God). buying a rug on the internet is a little scary because returning it would be a pain, but this gamble paid off!!! it was exactly what i was looking for. i highly recommend this rug for a little girl's room or playroom.